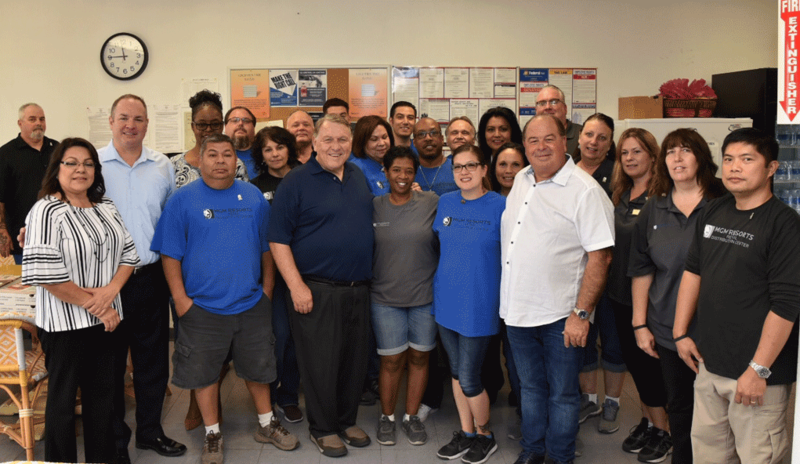 Jim Hoffa met with new members of Local 986 at the MGM merchandise warehouse in Las Vegas this week. The workers recently ratified their first Teamster contract covering delivery drivers and warehouse workers. Hoffa urged the workers to become involved in their local union and to vote this November especially for those living in Las Vegas who could vote for Susan Martinez, a candidate for Assembly District 12, who is a member of the local union. "We need to get out and vote for candidates that support working families, like your candidate Susan Martinez! We have so much at stake in this November's election that we have to get all working men and women to vote so we can fight back against those who want to push right to work. We fought back in Missouri and won! That's union power!" "The people you vote for affect your livelihood," Martinez said, "I'm a 30-year Teamster member. That's why I decided to run for office." John White, a delivery driver for the MGM warehouse since 1998 said he loves being a Teamster member. "This is a brand new era for us. I deliver merchandise to the Luxor and the MGM hotels. We wanted to be Teamsters for years and finally, we are!" "We've got great leadership now at the local and we are organizing more than ever. We represent valets, front desk staff and many other jobs throughout Las Vegas," Hoffa said.